mJose Mourinho will not sign a new defender in January despite losing Ivorian centre-back Eric Bailly to the Africa Cup of Nations, the Manchester United manager said on Friday. Mourinho has been linked with a potential move for a central defender, with Southampton's Portuguese centre-back Jose Fonte having handed in a transfer request and reportedly a target for his countryman. But Mourinho says that with Phil Jones back to full fitness and in fine form and Chris Smalling and Marcos Rojo performing solidly, he will not make any such move. "No, I wait for Bailly," Mourinho told reporters at the United training base west of Manchester. "I hope the three can control the situation in those eight matches. "I will try to rest one in every game. On Saturday (against Reading in the FA Cup) I will rest one, against Hull (in Tuesday's League Cup semifinal first leg) another. "We'll try to make a rotation between these three. We still have Daley Blind as the fourth in case we need him to play there. We have Michael Carrick, so let's try." Benfica defender Victor Lindelof has also been strongly linked with United, but Mourinho's position suggests the Sweden international may now have to wait until the end of the season to complete any move. 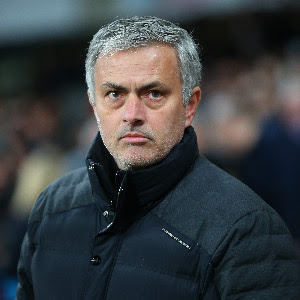 Despite being satisfied with his squad, Mourinho says it is a tall order to expect his team to cope with the pressure of competing on four fronts: the Premier League, League Cup, FA Cup and Europa League. "I have 24 players," said Mourinho, who has revealed he will not consider selecting Morgan Schneiderlin or Memphis Depay while they appear likely to leave Old Trafford in the January transfer window. "I cannot have 25 or 30. We have the right number of players. Is every player the same? No. Let's be realistic. The squad is good, but not every player is the same. "One thing is to play Antonio Valencia at right-back, another thing is to play another one. One thing is to play Paul Pogba and another thing is Paul Pogba not being available to play. It depends on the situation. "What I know is there are teams without European competitions and we are in the worst European competition to play because if you go all the way, you have matches and matches and matches non-stop. "We have a two-legged semifinal against Hull. If we play the final, if we beat Hull, we would have to play against Manchester City later because it's scheduled for the day of the final. "So I hope we are going to have a very complicated situation. But it would be very complicated." Mourinho's meeting with Hull in Tuesday's League Cup semifinal first leg will see him face the east Yorkshire club's new manager, his countryman and friend Marco Silva. "Let me wish my friend Marco big luck," said Mourinho. "He's a talented young manager. I want to wish him all the luck, except against us obviously. "And I want to make it very clear that my job is football manager, not football agent. And I have nothing to do with Marco coming to England. "He came to England because he is good and because he had good results previously!"